he Ellipse was introduced in 2000 as a fountain pen and a ball pen and by 2001 the line also included a roller ball and mechanical pencil. It sported a new kind of clip, keeping the basic arrow design but adding an attractive elliptica droplet at the top, about where the blue diamond was found on more vintage pens. The 23k gold plated clip went all over the top, a bit like the Eversharp Skyline and a like likewise gold plated, elliptic (oh yes) cap band, very similar to the Mont Blanc Meisterstück “12” of the 1960’s protected the cap lip. 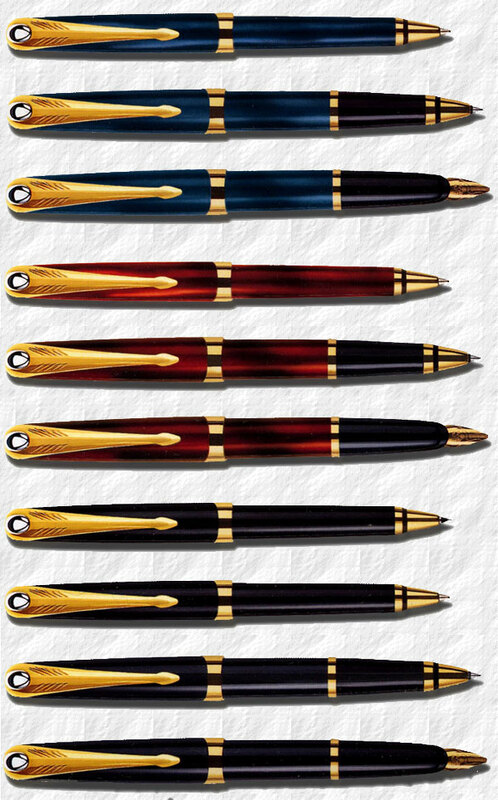 The nib was in solid 18k engraved with the elaborate P. The Ellipse fountain pen sold for about $155, the roller ball for $115, the ballpoint for $100 and the pencil $75. It sported a rather fat body which had coats of laquer on a solid brass base. t’s been said about it that the Ellipse was a decidedly modern pen that managed to mix the vintage style of the Parkers with a contemporary design. The truth is that it failed to attract the public’s eye, and it was discontinued already in 2002, thus making it an instant collectible, especially the pencil can even now (2007) be hard to find.